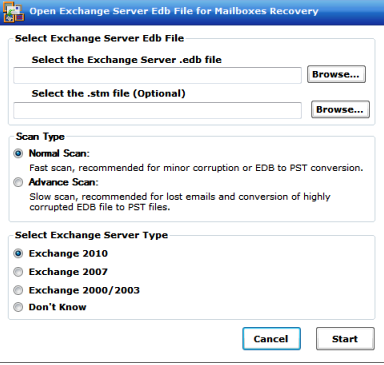 Geeksnerds Exchange Recovery software is equipped with two types of scans to recover corrupted or inaccessible Exchange database and to retrieve mailboxes. Normal scan is recommended for minor corruption. Advanced scan could be used for retrieval of deleted emails from mailboxes. 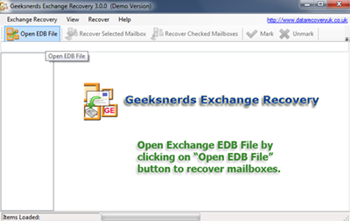 Geeksnerds Exchange Recovery software supports the mailbox database EDB files of Microsoft Exchange Server 2000,2003, 2007 and 2010. Users can select version of Exchange server for mailbox recovery by selecting “Select Exchange Server type”. STM file may also contain some of mailbox data, so it is recommended that you should select .STM file with EDB file, to get better results. After the completion of the steps, selection of EDB file, Scan types and Server version, the mailbox retrieval software will show all the mailboxes and emails. 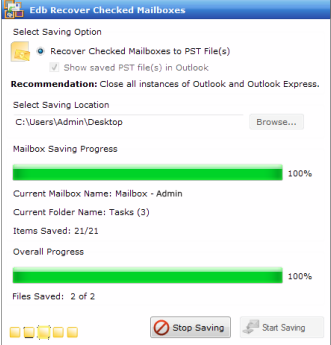 Desired mailboxes can be saved by individually selecting each mail box or multiple mailboxes from the tree structure created by Exchange Recovery Software. After selection of mailbox or the items, select the location for saving. Check the “Show saved PST file(s) in Outlook” option, if desired. Also give the path for saving the selected mailboxes and click on the “start saving” option. The user must have installed Microsoft outlook on the system in order to start recovery.